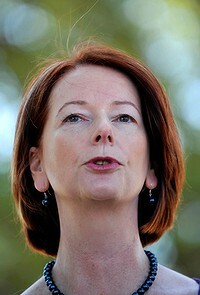 Julia Gillard, Federal minister for education. Julia is awarded the Idiot Of The Year 2009 for her potential to damage confidence in public schooling, her flip flop on league tables and her continued faith in the face of all evidence and public opinion that NAPLAN information should be made public. Today her media release finally acknowledged that it was likely that the myschool website and NAPLAN data would be used for league tables. Sorry Julia, if you provide the ammunition for producing misleading information, it is your fault. Media is renowned for producing sensationalist data and you are well aware of it - the potential for damaging schools rebuilding their reputations after poor government curriculum policy over many years far outweighs perceived benefits. State schools will close, pressure on parents to put students in independent schools will rise (for no academic benefit putting further stress on financially struggling families) and it will be the fault of your policy when the majority of people are saying this was a stupid idea. A school's level of disadvantage is notorious to define (see the issues that occurred using bureau statistics for the ghetto allowances in WA). More-so the ability of a school to produce true generational change takes generations to measure. Where gentrification in an area is occurring, four years of lag will exist between when the census occurs and when SEI is measured. Furthermore it will take 13+ years for these students to start entering the system (although it is more likely the struggling school will be closed and sold) and it's likely the new students won't have a nearby public school to go to anyway. With data at least four years old, principals have changed, teachers moved on, the school is different to the index. This statement is one big furphy. Ok, myschool statistics could identify some schools that need more help for disadvantaged students but why does this information need to be public (unless the idea is to use student results for political gain)? Why stigmatise students, teachers and schools? I have no argument that NAPLAN results could be used to help identify struggling schools, but why compromise the results by discouraging good students from entering the school whilst positive change is occurring and extra funding is available. Julia, you are creating a self defeating system. Yet, has anyone considered that low SES students test poorly anyway and their actual understanding is usually higher than their scores. This is due to the averaged nature of NAPLAN scores. Many things effect the scores. Students "throw" the test as they do not value the results, have performance anxiety generally passed on by poor performing parents. In general, a lower weighting of importance is put on tests by schools due to a whole range of factors. Furthermore, test results are skewed by teachers wasting whole terms coaching students on how to answer NAPLAN questions. Topics are introduced out of sequence (to the detriment of students) to maximise NAPLAN results. The NAPLAN scores (if they are meant to identify low performing schools and help low performing students) are a poor measure of their actual performance! Even when schools become earmarked for change, in many cases it simply will not occur no matter how much money is thrown at the school (and subsequent stress placed on teachers to perform miracles) due to dietary issues, birth defects, difficult circumstance, limited positive adult (especially male) role models, limited parental support, refugee cohorts, additional needs students, behavioural issues, alcohol and drug abuse, gang involvement, criminal behaviour, difficulties in identifying, attracting and retaining good teachers/administration, financial issues at home, generational endemic poor attendance, domestic violence and other such issues that cannot be changed by a school alone. A bigger picture approach must be taken in many cases. Issues with current league tables (measuring student scores rather than career success, issued by The West newspaper in WA) is further proof that the myschool website is built on a flawed premise. A school can have near 100% of their aspirant university students achieve their dream (being the first in their family history to attend university) yet still be last on their league tables due to the cutoffs assigned to presenting scores (see current issues with 75+ TER recording in WA). If the Liberal party said they would dump league tables, I would urge teachers to vote for them and I'm guessing so would many others. It would be a foolish Labor party that ignores this sentiment. WA was lost due to the teacher vote. Teaching voter backlash is not something to be ignored. When public opinion becomes a tool for government intervention (and not the other way around) it indicates a government unable to control. Releasing NAPLAN information to stir public support for government intervention rather than just identifying issues and solving them, speaks of a government more interested in polls than doing good in the community. Julia, if you fail to see the issues with this idea or are only going through with it for political reasons - you have to be an idiot. You are a worthy winner of the IOTY for 2009. There was no competition. Julia taking another potshot at teachers here (have a giggle at the stretched neck photo of Julia).